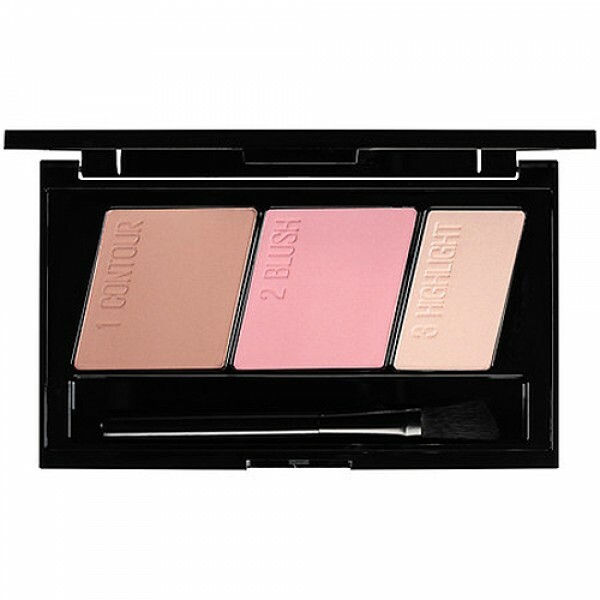 The contoured face is now so easy to achieve with Maybelline New York's Master Contour Palette. Maybelline New York's Master Contour Palette is an easy-to-use 3-step face contouring kit featuring a contouring powder, blush and highlighter to enhance your best features, with an angled brush for easy 3-step application. CONTOUR: Use the narrow side of the angled brush to blend the contouring powder in a 3 shape along the hairline, under cheekbones and along jaw. BLUSH: Use the wide side of the angled brush to apply blush onto the cheekbones above contouring powder and blend. HIGHLIGHT: To finish, highlight with your finger above cheekbones, on centre of forehead, bridge of the nose and chin. G3485: TALC, SYNTHETIC FLUORPHLOGOPITE, TRIISOSTEARIN, PHENYL TRIMETHICONE, MAGNESIUM STEARATE, CALCIUM ALUMINUM BOROSILICATE, CAPRYLYL GLYCOL, ALUMINA, SILICA, CALCIUM SODIUM BOROSILICATE, TIN OXIDE, MAGNESIUM SILICATE, [+/- MAY CONTAIN: CI 77891 / TITANIUM DIOXIDE, CI 77491, CI 77492, CI 77499 / IRON OXIDES, CI 75470 / CARMINE, CI 77007 / ULTRAMARINES, CI 15850 / RED 7, CI 77742 / MANGANESEVIOLET, CI 15985 / YELLOW 6 LAKE, CI 77400 / BRONZE POWDER, CI 42090 / BLUE 1 LAKE, CI 45410 / RED 27, CI 45410 / RED 28 LAKE, CI 77163 / BISMUTH OXYCHLORIDE, CI 77400 / COPPER POWDER, CI 77000 / ALUMINUM POWDER, CI 19140 / YELLOW 5 LAKE, CI 77510 / FERRIC AMMONIUM FERROCYANIDE, CI 16035 / RED 40 LAKE, CI 15850 / RED 6, CI 73360 / RED 30 LAKE, CI 15850 / RED 7 LAKE, CI 77510 / FERRIC FERROCYANIDE] F. I. L. D177136/1. If you have any queries regarding certain formulas and ingredients, please contact L'Oréal Australia Consumer Affairs on 1300 369 327.